The Hollywood Records/Lyric Street re-issue of Big Mon: The Songs of Bill Monroe under the new title Ricky Skaggs and Friends Sing The Songs of Bill Monroe moves down four places to No. 48 in its fourth week, according to the April 6 Billboard country albums chart released Thursday. The CD, which features the Dolly cut "Cry, Cry Darlin'," originally made it to No. 42 with nine weeks on the chart when released on Skaggs Family Records two years ago. In the same chart, the Songcatcher soundtrack, which features the wonderful Dolly duet "When Love Is New," drops one space to No. 75 for a 31st chart week. It had peaked at No. 42. On the World Music Albums chart, Irish group Altan's The Blue Idol, boasting the gorgeous Dolly duet on "The Pretty Young Girl," fell out of the 15-position chart after just one week at No. 15. Could 'Dolly & Friends' Be Delayed More? It looks as if the Dolly & Friends three-DVD collection first reported to you on Dollymania last fall will be delayed for release even further. The video's distributor this week posted most of its planned releases through June, and the Dolly collection remains on the "In The Works" category with no known release date. More information will be here as soon as it becomes available. The Dolly singles discography has added all of her British pop chart appearances, thanks to the kind information provided by www.uktop40.net webmaster Ed Wilkinson, who (upon the request of Dollymania) has also added her chart history to his site which chronicles Great Britain's hitmakers. What his research showed was that only two of her songs were chart hits in England (which doesn't have a country singles chart) -- "Jolene," which made it to No. 7 in 1976, and "Islands In The Stream," which also went to No. 7, in 1983. She broke the top 50 with "9 to 5" (No. 47) in 1981. Her only other chart appearances were "Here You Come Again" (No. 75 when released as a single overseas in 1984) and "The Day I Fall In Love" with James Ingram, which made it to No. 64 in 1994 even though it didn't chart in the U.S. Thanks, Ed! Also look for her complete Adult Contemporary chart history to be posted on the charts page soon. The singles discography and chart history page is available here, and albums discography and chart history is available here. Dolly got a photo and mention in a New York Times article Sunday considering the fate of country music following the honoring of roots music at this year's Grammy Awards. Writer Neil Strauss blames the blandness of country radio and lack of quality artists such as Dolly, Nickel Creek and Alison Krauss from the airwaves on advertising. Simply put, he argues, the key demographic for country radio are young adult females, so the music is tailored to only that group. This is opposite other forms of music, such as rock, which has many formats, he points out. Steve Gardner, promotions manager at Sugar Hill Records, which distributes Dolly's records, agreed, noting: ""If rock can have classic rock and hard rock and soft rock and alternative rock, why can't we have country and Americana? Surely there's room for that. I mean look at the Grammys, you have Lucinda Williams winning best rock song, Ryan Adams nominated all over the place, Dolly winning another Grammy. It's happening out there." However, industry insiders said that broadcasters are unlikely to change their habits unless another large demographic as appealing to advertisers as young adult females can be identified for roots music. Read the full article here. Thanks, Stan and Christopher! Dolly makes a guest appearance on The Stevens Sisters' new CD, Little By Little, due in stores April 23, according to their label, Rounder Records. Dolly sings on the duo's cover of "I'll Never Say Goodbye," which originally appeared on Dolly's Hungry Again. In press materials, the label quotes Dolly as asking, "Ain't they good?" She should know. The duo are frequent performers at Dollywood. The album was produced by Dolly's first-cousin, Richie Owens (who also produced Hungry Again). Rolling Stone released its critics' list of the 50 "coolest" records of all time on Monday, and while Dolly didn't make the cut herself, she is included in the only country album included. Merle Haggard's 1976 greatest hits collection Songs I'll Always Sing, which comes in at No. 42, features Dolly's composition "Kentucky Gambler," which he took to No. 1 in 1974. After being contacted by Dollymania about Dolly having never won a Razzie Award for worst acting, the Ottawa Sun reporter who wrote the article referenced in the March 22 news update apologized. "It was a flippant remark at best (or worst)," he noted. "And not researched. Sorry to all the Dolly fans." The article had incorrectly asserted that Cher, Dolly and Whitney Houston had all won acting Razzies, given for worst film performances. In reality, Cher has never been nominated, Whitney was nominated but lost, and Dolly's only win was as the composer of Worst Song ("Drinkinstein" as performed by Sylvester Stallone in Rhinestone) and she has never been nominated for acting. Little Sparrow slips one spot to No. 19 in its 58th week on the British country albums chart released Sunday. The Grammy-winning CD peaked at No. 1 for eight weeks last year. Also overseas, Rik Waller's cover of Dolly's "I Will Always Love You" falls five places on the UK pop singles chart to No. 16 in its third week; it had peaked at No. 6. Tenn To Radio: Play Dolly! In a great article in Saturday's The Tennessean, writer Craig Havighurst lamented the sad state of today's country radio. He noted that play lists have shrunk to about 25 pop country tunes on an average mainstream country station with no roots music being played -- no bluegrass, singer-songwriter folk, country rock, etc. He cited studies which show that country radio has lost the majority of its core audience over the past five years as ratings have dropped each year in that time frame, problems which he suggested are caused by the homogenous country pop sound dominating the airwaves. To combat this problem, he suggests a dozen current songs which "wouldn't sound out of place on today's country radio but that would open the spectrum up a bit, to win over new fans and delight the current ones." His No. 1 pick: Dolly's "Shine." About the song, he wrote: "Dolly is making more than credible music � perhaps the best of her career � but country doesn't want to touch her with a 10-foot pole. That's really hard to understand. This spirited cover of a Collective Soul hit is one of the most accessible on Parton's Little Sparrow. The track got played frequently on CMT and won the Grammy for best female country vocal performance. It also could have won prizes for its dazzling, enervating instrumental work . . . It's one of numerous songs that could further cultivate the interest out there in bluegrass without dwelling on the hard-core high and lonesome, which may not be mass market music. This, however, should be." Dolly also made the list at No. 3, for Paul Bewster's "Slowly I'm Falling to Pieces," which features her singing harmony. He noted about this song: "How about playing this one just because it's a great song that will excite listeners and draw in new ones?" Some other Dolly ties were easy to see, with Sparrow guests Nickel Creek and Alison Krauss making the list with their current singles at No. 7 and 11, respectively. Read the full article here. Dolly is participating in the third annual Mask Market, an event to raise funds for Hospice of Metro Denver in Colorado. More than 400 celebrities and local folks handpaint masks which are auctioned to benefit the charity. Along with Dolly, painters this year include Barbara Striesand, Jesse Ventura, Whoopie Goldberg, Elizabeth Dole, Glenn Close, Bill Cosby and others. The masks will be on display at the Cherry Creek Shopping Center in Denver April 15 through May 26, during which time the silent auction will be held. For more information, visit their site at www.themaskproject.org. Thanks, Holly! The Hollywood Records/Lyric Street re-issue of Big Mon: The Songs of Bill Monroe under the new title Ricky Skaggs and Friends Sing The Songs of Bill Monroe moves down eight places to No. 44 in its third week, according to the March 30 Billboard country albums chart released Thursday. The CD, which features the Dolly cut "Cry, Cry Darlin'," originally made it to No. 42 with nine weeks on the chart when released on Skaggs Family Records two years ago. In the same chart, the Songcatcher soundtrack, which features the wonderful Dolly duet "When Love Is New," remains steady at No. 74 for a 30th chart week. It had peaked at No. 42. On the World Music Albums chart, Irish group Altan's The Blue Idol, boasting the gorgeous Dolly duet on "The Pretty Young Girl," debuts at No. 15. Yet another version of Dolly's immortal "I Will Always Love You" has hit American shores. This time, songstress Salena Jones offers a great jazz version on the new CD Loving You: Love Songs To You From Broadway And Hollywood. The new collection of various artists from the British Jay Records puts Dolly in the same league as composers Andrew Lloyd Webber and Stephen Sondheim, among others. Get your copy here. 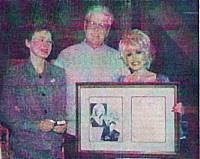 According to a story in last week's Tennessee Star, Dolly presented retiring Dollywood vice president of marketing Dan Rohman with a framed copy of the sheet music to "I Will Always Love You" during a ceremony at which Rohman was honored by the City of Pigeon Forge for his contributions to tourism development, including chairing the city's Tourism Advisory Board. According to the report, Dolly made a surprise appearance to sing a chorus of the song as it played on a videotaped congratulations she had recorded for Rohman. (Image at left from Tennessee Star showing Dan, his wife and Dolly.) Thanks, Debbie! An Ottawa Sun article over the weekend noted the several pop divas who are trying their hand at acting, comparing them to previous successes and disappointments. Of course, they discuss Cher, who won an Oscar for Moonstruck and Cannes Film Festival Award for Mask, but whose film career lately has been nonexistent. Then they talk of Dolly, saying her success in 9 to 5 was "inspired" and critically-acclaimed, earning her a Golden Globe nomination for acting and Oscar nomination for best song. It says she "kept delighting audiences" through The Best Little Whorehouse In Texas, Rhinestone and Steel Magnolias," but her luck ran out with Straight Time" (actually, Straight Talk was the film's title). It noted her return to the big screen in April with the slapstick comedy Frank McKlusky, C.I.. Also touched on are Whitney Houston and Madonna. One final Dolly mention in the article says that Madonna has won more Razzie Awards (given for the worst movies of the year) than Cher, Dolly and Whitney combined for their "screen performances", "though they all have won that dubious honour." (Actually, none of those three ladies mentioned with Madonna has ever won a Razzie for bad acting. Dolly has never even been nominated for her "screen performances." The only Razzie she ever won was as a composer for Worst Song -- "Drinkinstein" from Rhinestone, a film for which co-star Sylvester Stallone won one of his many Worst Actor awards. She also received a Worst Song nomination as composer of "Sweet Lovin' Friends" (performed in the film as a duet with Stallone) and Worst Score as composer for the soundtrack but lost. While Whitney was nominated for Worst Actress, Worst New Star and Worst Song for The Bodyguard, she didn't win any of them, and I looked over the awards' archives and couldn't find a single nomination for Cher.) Read the full article here. Little Sparrow slips three spots to No. 18 in its 57th week on the British country albums chart released Sunday. The Grammy-winning CD peaked at No. 1 for eight weeks last year. Also overseas, Rik Waller's cover of Dolly's "I Will Always Love You" falls five places on the UK pop singles chart to No. 11 in its second week. Remember that the 1999 Lifetime mockumentary Jackie's Back!, which features three hilarious Dolly cameos, arrives in stores on VHS and DVD Tuesday. Get your copy here! Dollymania has been informed that a grassroots effort is underway to try and convince Dolly to run for governor of Tennessee. Organizers, who are convinced that Dolly would easily win if she ran, say they already have "several thousand" voters' signatures on a petition circulating around the state to ask Dolly to qualify for the election by the April 4 deadline. If you live in Tennessee and would like a copy of the petition to pass around, e-mail Rem Schuil, chairman of the Dolly For Governor Valentine Committee, at schuilrsp@msn.com. Organizers ask that completed petitions (which have room for 20 signatures each) be mailed back to them no later than March 27. If she runs, Dolly wouldn't be the first country star to try; the legendary Roy Acuff made an unsuccessful bid for governor several decades ago. The Hollywood Records/Lyric Street re-issue of Big Mon: The Songs of Bill Monroe under the new title Ricky Skaggs and Friends Sing The Songs of Bill Monroe shoots up 26 places to No. 36 in its second week, according to the March 23 Billboard country albums chart released Thursday. The CD, which features the Dolly cut "Cry, Cry Darlin'," originally made it to No. 42 with nine weeks on the chart when released on Skaggs Family Records two years ago. In the same chart, the Songcatcher soundtrack, which features the wonderful Dolly duet "When Love Is New," re-enters at No. 74 for a 29th chart week. It had peaked at No. 42. According to a story in Thursday's Tennessean, Nashville's Metro Council is considering a "sidewalk of the stars" near the Ryman Auditorium and Country Music Hall of Fame similar to the Hollywood Walk of Stars. Although the story noted that the Hall of Fame had a similar attraction in storage, with bronze stars on tiles honoring about 300 performers from Dolly (who, of course, also has a star on the Hollywood attraction) to Tammy Wynette, it later discovered that the Hall's walk had, in fact, been destroyed. The full story is available here. While you're here, take a moment to view the new and improved Dollymania Dolly Store. It's been updated with new CDs, while some out-of-print ones have been deleted. I've also changed the layout to an easier to navigate and easier to understand format complete with photos of most of the covers of Dolly CDs which are currently available on the market. It features her original releases, movies, compilations and appearances on others' records, too! See if your collection is missing something important! Dolly will, in fact, record a duet with gospel legend Dottie Rambo, Dollymania has exclusively confirmed. As you may recall, it was reported here a couple of weeks ago that Dottie had made the comment on a cable ministry program that she and Dolly had committed to doing a project together. At a Dottie concert in Houston over the weekend, a reader acting on behalf of Dollymania asked Dottie about the report. Dottie confirmed that she and Dolly are to record a duet in the very near future. "Yeah, we are going to do it soon," she replied. Look for more details here as soon as they become available. A member of the Southern Gospel Hall of Fame (which is located at Dollywood), Dottie Rambo has ministered through her music for five decades, much of that time as a friend of Dolly's. When Dottie was honored during a ceremony at Emmanuel Bible College last year, Dolly addressed the audience via videotape. Afterward, Dottie expressed a strong desire to work with Dolly again (the two had appeared together on The Porter Wagoner Show about 30 years ago). Thanks! This year's alternate Dolly convention, the BlondeButterFly Bash, is filling up, I'm told. Organizers informed me on Monday that they had updated their information site (available here). The site's update notes that since the event was first announced all rooms at the host site, the Green Valley Motel South Convention Center in Pigeon Forge, have been booked. Rooms are still available, however, at nearby hotels. The event will celebrate Dollywood's annual opening weekend with the party from 8:30 p.m. until 11 p.m. Friday, April 5. The deadline to reserve vendor space at the party ($20 for a 3x8 table) is March 31. As you may recall, Dollymania was the first to confirm that the annual Dolly Collectors' Convention would not be held this year (although it may return in 2003) and that this event was being established as an alternative in its absence. Visit their site or call 214-929-4428 for more information. Thanks, Harrell! I was also informed on Monday that the link which Buena Vista Pictures had supplied for the official Frank McKlusky web site, www.frankmcklusky.com, is incorrect. There had been no content on the site since it was first announced in press materials about a month ago. Then a few days ago, copy appeared on the domain about an actual person named Frank McKlusky and offering links to genealogical information on his family name. I haven't gotten any word yet from film officials on if there is another address for the film. Also, there is no word yet on whether it may be delayed. As you may recall, Dollymania confirmed two weeks ago that the film was at that time still scheduled for an April 26 release but that, as with any film, this could always change. Officials with Buena Vista said at that time that a more firm date should be known by the end of March. (See what information is currently available by visiting the Dollymania "McKlusky Page" here!) Thanks, David! Dolly's second bluegrass effort won her a second Association for Independent Music (AFIM) Indie Award, it was announced Monday night. Little Sparrow beat out Dale Ann Bradley's Cumberland River Dreams and the Dry Branch Fire Squad's Hand Hewn for Best Bluegrass Album, an honor which she won in 2000 for The Grass Is Blue. The Songcatcher soundtrack, which features a Dolly duet, didn't fare as well, losing Best Soundtrack to The Dark Punk. British newspaper The Guardian on Monday morning (actually, Sunday evening U.S. time) published a story announcing a partnership between RCA parent company BMG and U.K. indie label Sanctuary Records to issue a series of compilation albums by RCA artists such as Dolly, Perry Como, The Kinks and Small Faces. Sanctuary will issue 20 compilations this summer, followed by 10-12 each quarter for the next three years. The label's CEO, Joe Cokell said: "Rights to different artists' songs are often held by different labels. By coming together we can offer fans of artists like Dolly Parton a single greatest hits package that is more comprehensive than they've ever seen before." Sanctuary has emerged over the past couple of years as a powerhouse label overseas, with its record-level profits and sales attributed largely to the success of Dolly's two bluegrass albums, which it distributed in Europe. The full story is available here. Perhaps Dollywood's most famous permanent resident, the bald eagle Challenger, will fly across the grounds of the U.S. Capitol in Washington at 11 a.m. Tuesday morning when congressional leaders speak and sing "America The Beautiful" on the Capitol steps, it was announced on Monday. Dollywood houses the American Eagle Foundation's sanctuary, which holds the largest collection of non-releasable bald eagles in the world. Little Sparrow slips one spot to No. 15 in its 56th week on the British country albums chart released Sunday. The Grammy-winning CD peaked at No. 1 for eight weeks last year. In other overseas chart news, Pop Idol top 10 finalist Rik Waller's first single, a cover of Dolly's "I Will Always Love You," debuts on this week's UK pop singles chart at No. 6. The Pop Idol contest's winner, Will Young, remains at No. 1. I caught a quick glimpse of Dolly on VH1 over the weekend. The network's TV Moments series focused on Cher Saturday night, and in its coverage of her 1978 Cher . . . Special, it noted that Dolly and Rod Stewart were guests and showed a quick clip of Dolly and Cher together. The announcer went on to incorrectly say that the show was nominated for three Emmy Awards, at the same time giving the impression that the nominations were recognizing Cher. The special, in fact, netted two nominations: Best Lighting (which it won) and Best Supporting Actress for Dolly, who lost to Gilda Radner. In 1972, comedienne Goldie Hawn released her first (and, I believe, only) musical album, Goldie, which opened with her cover of Dolly's "My Blue Tears," as arranged by Porter and Dolly especially for the album. Well, the long-out-of-print Reprise record returns this week, with its first-ever release on CD scheduled for Tuesday. The original album jacket had a great photo on the back of Goldie sitting and talking with Porter and Dolly, but I haven't seen the CD, so I don't know if the picture is included in this release. Get your copy here! We'll learn on Monday whether Dolly walks home with another Association for Independent Music (AFIM) Indie Award for Best Bluegrass Album. Dolly's Little Sparrow faces off with Dale Ann Bradley's Cumberland River Dreams and the Dry Branch Fire Squad's Hand Hewn for the honor, which she won in 2000 for The Grass Is Blue. In addition, the Songcatcher soundtrack, which features Dolly, is up for Best Soundtrack/Cast Recording against That Darn Punk and The Visit. Winners will be announced in a ceremony at the San Francisco Marriott on Monday evening. Thanks, Tony! The Boston Globe on Friday raved for Altan's new CD, The Blue Idol, particularly Dolly's appearance. The article notes: "Country superstar Parton joins Ni Mhaonaigh for an achingly tender duet of 'The Pretty Young Girl.' Their voices meld like those of old neighbors, which Ni Mhaonaigh attributes to similarities between her Donegal childhood and Parton's musical roots in Tennessee. 'We both come from a traditional background,' she says. 'We like to find a good melody and then change it when we sing. You don't become conscious of your singing, you just sing. She doesn't seem to train her voice; I don't train my voice. I just open my mouth and hope something comes out. It's not like a consciousness; it's like it's coming from somewhere else.'" The full article is available here. While a Grammy win wasn't enough to push Dolly's Little Sparrow back into the Billboard top 75 country albums, the Hollywood Records/Lyric Street re-issue of Big Mon: The Songs of Bill Monroe under the new title Ricky Skaggs and Friends Sing The Songs of Bill Monroe debuts at No. 62 on the March 16 chart. The CD, which features the Dolly cut "Cry, Cry Darlin'," originally made it to No. 42 with just nine weeks on the chart when released on Skaggs Family Records two years ago but did earn a Grammy nomination for Best Bluegrass Album (Dolly beat it with The Grass Is Blue). If you missed Dolly's amazing appearance on the PBS concert series Austin City Limits, the broadcast will re-air in most markets at 9 p.m. on May 4, it was announced this week. However, not all PBS affiliates carry the show, and some carry it at slightly different dates or times as the national schedule, so you'll need to check your local listings. Could It Make The Chart? The CMA touted female vocalist winners as this year's theme event at the Country Radio Seminar. Although Dolly did not perform, clips of her winning were shown to the audience at the event, CMT.com reported. Their story on Monday noted that in her acceptance speeches for winning the trophy in 1975 and 1976 she thanked Porter Wagoner for his hard work on her career even though she was in the process of severing ties with him and had ended their professional partnership. The music world lost a legend over the weekend when songsmith Harlan Howard died March 3 in Nashville. He was 74. The composer of more than 100 hits, including "I Fall To Pieces," he also wrote Porter & Dolly's No. 9 hit from 1969 "Yours Love," which debuted on the country singles chart 33 years ago Friday. Little Sparrow falls two spots to No. 14 in its 55th week on the British country albums chart released Sunday. The Grammy-winning CD peaked at No. 1 for eight weeks last year. In an article over the weekend in Wisconsin's Janesville Gazette, Jamie O'Neal discussed her family's band in which she played as a child. She said: "We opened for a lot of the country stars at the fairs. The one I loved the most was Dolly Parton. She was so sweet to us kids. And she loved hanging out with her band. I was just so impressed with her as a person, as well as a musician." Dolly gets a plug in the Grammy coverage in this week's Newsweek. In an article by Lorriane Ali and David Gates, they discuss in-depth the falling interest and sales of commercial "McMusic" and the direction that this year's awards took away from that format, mentioning Dolly in some pretty impressive company. "And it [commercial music] may still work for a while with customers too undiscriminating or unenterprising to ferret out more demanding and rewarding music with the help of public and college radio stations, music journalists, remote corners of the Internet � or, like, you know, friends? But one subtext of this year's Grammys was the backlash against McMusic even among the people whose salaries it pays: not just [Ralph] Stanley and O Brother [Where Art Thou? ], but such smart, individualistic and sometimes spiky artists as OutKast (rap album), Lucinda Williams (female rock vocalist), Dolly Parton (female country vocalist), Bob Dylan (contemporary folk album) and India.Arie (seven nominations)," they write. After many media outlets mistakenly said that Alison Krauss had won five Grammy Awards at this year's event because of her work with the O Brother, Where Art Thou? soundtrack, the Academy has put their foot down and clarified the issue, according to Sunday's The Tennessean. Yes, each artist appearing on O Brother (including Krauss and Emmylou Harris) will be credited with winning a Grammy for Album of the Year, but only the producer will receive award credit for Best Soundtrack Album and the Down From The Mountain companion CD winning Best Traditional Folk Album. This leaves the updated female country statistics as follows: Krauss is first now with 13 Grammy wins, followed by Harris at 11. Third place depends on your definition of country female artists. You could place Linda Ronstadt here because three of her 10 awards were in the country field (one solo honor for Best Female Country Vocal Performance and two Trio awards which she shares with Dolly and Harris), or you could count Dolly as third for her seven trophies. Next would be Mary Chapin Carpenter, The Judds, Anne Murray and Olivia Newton-John at fourth (or fifth) with five each, and Shania Twain and The Dixie Chicks at fifth (or sixth) with four each. My copy of Altan's The Blue Idol arrived Friday, and the duet between Dolly and lead singer Ni Mhaonaigh on "The Pretty Young Girl" is spectacular! Dolly sings the second and third verse and second chorus in a very soft yet emotive voice and joins Ni on the final chorus to harmonize in a very high, flowing tone over the melody. In the liner notes, the band notes: "Mairead's father, Francie, has given us his English translation of 'An Cailin Deas Og,' a love song from Co. Mayo. During the summer of 2000 while touring the USA we were delighted to be asked by Dolly Parton to play on her album Little Sparrow. This time Dolly joins us in a song from our side of the Atlantic Ocean." (As a bonus treat, you get a solo version of the song performed by Ni later on the CD in the original Gaelic.) The remainder of the album overflows with Celtic ballads both joyous and mournful as well as wonderfully sprite jigs and reels. If you don't have this impressive CD, get your copy here! At least one industry insider is saying not to expect changes in commercial radio programming after roots music swept the country categories of last week's Grammy Awards. Speaking at the Country Radio Seminar in Nashville, Atlanta radio powerhouse WYAY's operations manager Dene Hallam was quoted by CMT.com on Friday saying: "Don't be thrown off focus that Ralph Stanley is male vocalist of the year and Dolly Parton is female vocalist of the year," adding that their wins were aberrations. The report said that he compared the current roots music popularity to the upswing which "Dueling Banjos" received after being featured in the film Deliverance, which did not result in much interest in country music. The full article is available here. Yet another cover of Dolly's classic "I Will Always Love You" is on the way. According to a BBC report on Friday, 20-year-old Rik Waller, who was a top-10 finalist in the U.K.'s recent Pop Idol competition, will release his version of the song as a single on Monday. Expectations are high, as the competition's winner, Will Young, saw his first single pass 1 million copies sold in its first few days of release this week to become that nations' fastest-selling single of all time. Of course, Dolly first wrote and recorded the song in 1973, having her first No. 1 version of it the following year. Linda Ronstadt covered it for her Prisoner In Disguise in 1975, and then Dolly had her second No. 1 version from The Best Little Whorehouse In Texas soundtrack in 1982. The song faded for a decade, before Whitney Houston released the biggest hit in the history of music by any female artist with her take on it in 1992 from The Bodyguard soundtrack. Since then, it has become a standard recorded by artists as varied as Kenny Rogers, Leann Rimes, Gloria Gaynor, Roger Whitaker and John Tesh before Dolly released her third version in 1995, a No. 15 duet with Vince Gill from Something Special. A reader asked me whether Dolly's third win for Best Female Country Vocal Performance on Wednesday set a record, and I didn't know, so I looked it up. Currently, Mary Chapin Carpenter holds the record with four wins, as she took home the trophy each year from 1991 through 1994. Dolly is tied in second place with Emmylou Harris and Anne Murray for three wins apiece, and Shania Twain, k.t. oslin and Tammy Wynette are in third with two wins each. The award has been given out each year since 1964, and 26 women have been its recipient in that time. We could be up for a new Dolly gospel duet in the near future! I'm told that gospel legend Dottie Rambo over the weekend appeared on TBN's Praise The Lord program and mentioned that she and Dolly were committed to doing a project together soon but would not elaborate on it. Thanks, Robert! Alas, Dolly will not be participating in the bi-annual Stars Over Mississippi concert in Amory, it was announced Wednesday evening. As you may recall, she headlined the most recent benefit concert two years ago but had to cut her set short due to the affect the cold weather at the outdoor event had on her voice. Brooks and Dunn will headline the Oct. 5 show, to be hosted by Whoopi Goldberg and Ray Romano. Also appearing will be Weakest Link host Anne Robinson, Marylu Henner, Delta Burke and husband Gerald McRaney, Debbie Allen and Kathy Ireland. Tickets go on sale Monday. Dollymania passed the quarter-million mark for visitors to its front page on Thursday. In its slightly more than three years of existance, the site has grown from a few dozen visitors each month to more than 15,000 a month and has been noted in several national (and international) publications, television programs, and other media. Thank you all for helping me spread the word about the greatness of Dolly, and I hope you'll keep coming back and enjoying what you see! P.S. Remember, this site is about you, the fans. So please e-mail me if you have any comments or suggestions for the site's improvement or if you want to pass along a news item you've come across. Thanks!